As we conclude our Centennial celebration, Kellogg and its global community can take pride in knowing that our school has reached an impressive milestone, one that proves the enduring value of our curriculum and culture. Over the last 100 years, our thought leadership has elevated Kellogg among the world's most prestigious institutions. Another unique quality that distinguishes the Kellogg brand is the character of its people. Our graduates are skilled leaders, but they are also team-oriented, caring individuals who give from the heart. In this edition of Kellogg World, focused on sustainable leadership practices, you will meet some of our alumni who are combining their analytical talents with their passion to make a long-term positive difference. During the last year, I also have seen the passion that our graduates and other supporters have for the school. Each of our global Centennial events was an opportunity to experience firsthand the power of the Kellogg network as we came together to reflect on and celebrate the strengths that have brought us this far, and that will carry us farther. These Centennial events were important in another way. They were a chance to look ahead, as Kellogg always does, to see how the frameworks advanced in our MBA programs can continue to solve important challenges. By thinking globally and looking beyond conventional notions of business and success, Kellogg is educating leaders who make a broad impact across many types of organizations. I am personally grateful for those who are supporting and contributing to our leadership mission, and I know that we can count on your continued goodwill as we build on our success going forward. Of course, there is no better indication of our success than the exceptional graduates we produce, and at this time of the year we welcome the newest members of our alumni family. We congratulate these leaders from across all our programs, including those from our global Executive MBA Program partner schools who joined us for Convocation in Evanston. We wish you the best as you continue your journey and we remind you to stay connected to Kellogg for the resources to develop a career that is successful and significant. On a personal note, I too am continuing my professional journey. As you already may know, after eight years as dean of the Kellogg School, I am stepping away from this role and rejoining the Marketing Department full time, effective Sept. 1, 2009. I am doing so to devote more time to my family, which has been a constant support for me, and to focus renewed attention on my research and teaching. In addition, I plan to continue to explore how I can advance management education more broadly. 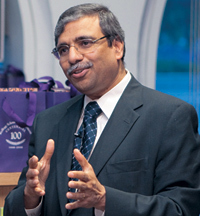 Northwestern University will conduct a global search for a new Kellogg dean. To ensure a smooth transition, Sunil Chopra, senior associate dean and the IBM Distinguished Professor of Operations Management and Information Systems, will assume the role of interim dean, effective Sept. 1, 2009. Making this decision was difficult for me, especially since many wonderful people, including alumni and colleagues, have made this job a joy. I extend my special appreciation to those who have helped advance my vision for the Kellogg School. The list is long, but at the top are senior administrators at Northwestern — President Henry Bienen, Provost Daniel Linzer and the late Provost Larry Dumas, among others. Within Kellogg, I thank our faculty and staff for their consistent efforts to create a world-class institution. They are the heart of our school. I particularly thank the senior associate deans whose dedication over the years has helped drive the initiatives that today allow me to leave office knowing that Kellogg is in excellent condition as it begins its second century. Professors Robert Magee, Robert Korajczyk, David Besanko, Kathleen Hagerty and Sunil Chopra have my sincere gratitude for all they have done on behalf of Kellogg. Of course, my gratitude also goes to Dean Emeritus Don Jacobs, whose friendship, support and willingness to provide me with the chance to serve as his associate dean for five years gave me an opportunity to develop my own leadership ability. When I came to the dean's role in 2001, I knew that my leadership style could move the school from being individual-driven to institution-driven. To that end, I took steps to establish the systems and processes necessary for the school's efficient functioning in a highly competitive environment. The restructuring in the dean's office was part of this design, but we also have strengthened the Kellogg global brand and alumni network through the disciplined allocation of resources in our Marketing & Communications, Development, and Alumni Relations areas, to name a few. The implementation of the Kellogg Alumni Network, in offering our graduates access to valuable information and opportunities, is one example of our expanded outreach. More evidence of our engagement has been increasingly greater Reunion attendance. This year's Reunion, for instance, attracted a record 2,000 alums and family members. Importantly, too, over the last few years we have been examining the innovations and enhancements in terms of infrastructure that Kellogg will need to maintain its world-class standing. I am happy to report that, while details will be shared soon, the school is making excellent progress in this area and will be able to continue offering students a best-in-class MBA experience. During my tenure, I have made it a priority to strengthen academics at Kellogg. We have enhanced the school's curriculum, teaching and research, a fact recognized in mainstream surveys that consistently rank Kellogg among the world's top schools. Our international EMBA programs and academic alliances are thriving. Our faculty recruitment and retention are excellent. Our balanced strengths across the curriculum are attractive to top prospective students and to a wide array of recruiters. With our focus on creating global leaders who make contributions of lasting significance, we offer a distinct value proposition that transcends traditional ideas of what the MBA degree can achieve. For me, being dean of this great institution has been a dream come true. I leave the dean's office after eight years — the equivalent of two presidential terms. As I do, I recall a remark made at our opening Centennial Gala in Chicago last October. During his address, Chris Kennedy '94, the event's alumni chairman, said something that is true for me, as I believe it is true for many of you: "Kellogg has changed me forever."